When upright or in some cases lying down, the weight of your body combined with muscle imbalances can cause your spine to twist or sag. This can produce a bulging disc or Sciatic nerve pain which sends excruciating pain into your buttocks or legs. This pain is commonly referred to as Sciatica. Sciatica is a broad term which encompasses many symptoms stemming from the Sciatic nerve. Sciatic pain normally travels from your buttocks or hip, down your leg and in some sever cases can make it impossible to put weight on your leg. Other Sciatica symptoms include pain felt in the buttock, hip or parts of your leg or foot. Regardless of where your Sciatica nerve pain is felt it is important to get treated as untreated Sciatica can lead to permanent nerve damage. Most sufferers can get relief from Sciatica symptoms or even a short term cure by simply lying down and taking the pressure of gravity from their body. In some cases however it can be very difficult to find a position that is comfortable as the pressure from a disc bulge or herniation has built up on the Sciatic Nerve in the lower back region. Treatments which focus on just one part of the body expecting to provide Sciatica relief do nothing for the overall imbalances and have little lasting effects on Sciatic Nerve Pain. Often people have unnecessary surgery to release pressure from Disc Bulges irritating their Sciatic nerve. These surgeries don’t treat the muscle imbalances that are causing the pressure. After treating back pain and sciatica since 1988 I have found treating muscle imbalances the best way to get long term Sciatica Relief. Treating just the symptom is like replacing a tyre on your car that is worn on one side without doing a wheel alignment. The new tyre will be under the same pressure and end up worn out the same way. Similarly this is why most Sciatica treatments do not provide long term relief and the Sciatic pain simply returns later on. Among the most common causes of Sciatica is a herniated disc. Herniated means to bulge or stick out. The intervertebral discs are spongy that form a cushion between the vertebrae of the spine. These discs have strong outer layers made of cartilage with a soft gelatinous like center which acts as a shock absorber. Should the outer layer of the disc become weak usually through age or injury the soft center can herniate through the weakness causing a herniated or ruptured disc. During this condition a vertebra slips forward over the vertebra below. This can distort the spinal canal and results in Sciatic Nerve roots being compressed. Many therapists have blamed the Piriformis muscle or Piriformis syndrome for Sciatica. However in my experience it is rarely ever the cause and the treatment of the Piriformis muscle will not cure Sciatic Pain or even provide relief. Generally the body’s overall mechanics have a lot to do with Sciatica. Whenever a person sits or stands muscle imbalances in their body cause a Disc Bulge or Herniation because the frame sags or twists under their body weight and gravity. This can increase the pressure on the Sciatic Nerve where it exits around the L4, L5 or S1 region of the spine. To achieve relief from Sciatica this is what must be treated through special exercises and/or therapies. A simple adjustment, massage or stretches invariably irritate the Sciatic problem rather than relieve pressure from the Sciatic Nerve. There are key treatment areas to work on in the body to provide relief from Sciatic Symptoms however a general overall full body approach is required to re-balance the muscle system and release pressure from the disc bulge or herniation. Exercises and stretches often given to provide Sciatica relief further irritate the problem due to the muscles contracting which come with muscle imbalances that do not change when stretched. Rather the problem muscles often tighten further due to the lack of circulation getting to the muscle fibers, the root cause of their dysfunctional state. A holistic, full body, hands on approach to Sciatica taken by a professional SLM trained therapist can be very successful at providing relief for a Disc Bulge, Herniation or Prolapse which causes Sciatica and Sciatic Nerve Pain. We have trained therapists throughout Australia, England, New Zealand and America. You can even come and see me personally on the Gold Coast to receive the fastest most effective treatment available for your Sciatica Symptoms or back pain problems. If you need a method to treat your Sciatica or Back Pain problem yourself, our Book, Video or DVD in the Back Pain and Sciatica Self Treatment program provides many ways of treating your body and getting relief by helping yourself or assisting the work being done by a professional SLM Therapist providing your Sciatica treatment. This helps ensure you get the fastest relief from the Sciatica Nerve pain you are suffering from. I would strongly recommend a passive approach, at least to begin with as it is the best way to relief from Sciatica. Quickly treating Sciatica provides the best relief and avoids Sciatic Pain progressing to the point where surgery becomes and emergency option. A life involving extended periods of sitting it is crucially important to have a ergonomic chair. Depending on the chair it may be necessary for additional support from a back brace, lumbar roll or bassett frame. Practicing good posture will help activate your abdominal muscles which opens the spaces in your spine where nerves are vulnerable to being pinched. Simply walking (in some cases) or swimming/ water exercises can assist in strengthening your lower back. Getting relief from Sciatica and associated disc pain can be very difficult and a confusing journey for someone searching for answers to their pain. It seems to be that whoever you go to see for help will tell you that they know what’s causing your pain and will fix the problem. Yet months and many hundreds of dollars later, you can still be in just as bad or worse pain. What I explain to people is that there are 2 parts to a sciatica problem. There is the direct problem, being the issue with the disc itself, causing it to encroach on the spinal chord or sciatic nerve and secondly, there is the problem with the mechanics and alignment of body that sets the disc bulge up in the first place. Most treatments including things like, exercises for strengthening, stretching, spinal adjustments, drugs, injections, massage and even surgery, targets the disc bulge area, without considering the underlying problem with the body and this is why these treatments either don’t provide any lasting result or in the worst cases, makes the pain a lot worse. If you are someone still looking for answers for your sciatica or bulging disc problem there are a couple of things I would advise you to keep in mind. If the therapist you seeing isn’t looking at your whole body and how it is impacting on your disc and sciatic nerve, it’s unlikely you will get a long term fix from what they do. If you see someone 3 or 4 times and they haven’t made any impression on the pain, or they have made it worse, it’s probable that they are the wrong person to see and they will be unlikely to give you the sciatic pain relief you need. If a person attempts to fix you yet never touches your body to do any manual therapy on your muscles, I would be doubtful of them being able to take your pain away. Any solution for your sciatic nerve pain will most likely involve a holistic approach to treatment. That means that it will include information on diet, exercise, posture, lifestyle changes you might need to make, and most importantly manual therapy the loosen and balance your body and whole muscle system. Even if you decide to go for the surgery that has been suggested, it is important you find someone who can deal with the physical problems in our body as well so the irritation to your sciatic nerve doesn’t return and you can get back to an active lifestyle with long term sciatica relief. Most Doctors won’t have any advice for you in this area because it comes under the label of natural therapy and some may even dismiss it as not necessary, but if you follow up what I am saying here by downloading and reading my free book offered below, you will get a good explanation of why this step is so important as part of a long term solution to your sciatic nerve pain. 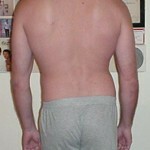 Pictures of typical Sciatica sufferers back … It’s not just about the disc and nerve. “I thought I would give your technique a go as I had been unable to relieve the pain any other way. I was having chiropractic help but did as you suggested with the balls and I found great relief from doing this exercise, it really does work!! So simple yet effective”. “Hi there and thank you for the self-help tips. I have used the instant relief technique and was surprised to find progressive relief over a period of days”. “I found your ball technique like a magic trick and even though that was an instant cure for my pain, I wanted to buy your program to show my gratitude”.